Pinnacle Signature Series II Wax Kit will give you depth and clarity! For a Limited Time receive the Pinnacle Complete Car Care System Instructional How-to DVD with your purchase of this kit! Retail value $12.99. 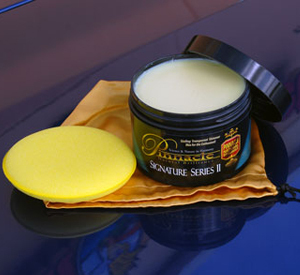 A complete car care kit built around Pinnacle's "Signature" Wax. Pinnacle Signature Series II Carnauba Paste Wax creates a warm, wet-looking shine with nature’s finest wax and fruit oils. The results are sizzling shine, depth, and reflection that enhance any type and color of paint.In addition to Pinnacle Signature Series II, we’ve included other premium Pinnacle products to help you maintain that high gloss shine. Our original carnauba wax has been updated with the latest polymer technology. The shine is wetter and slicker than ever before! Colors are deeper, reflections are clearer…Signature Series II is an exciting new chapter in the Pinnacle wax tradition. Bursting with carnauba, the wax has the same buttery texture and signature scent that can only be Pinnacle. Pinnacle Bodywork Shampoo has the smooth, silky feel and aroma of a luxury body gel. As you wash, natural coconut oils attach to surface dirt. These oils act as a lubricant. Sand and abrasive grit slide off in the rinse water without scratching the surface. New Improved Formula! Bodywork Shampoo now contains Tuff Suds ®.New technology uses cleaners suspended in the bubble's walls to scour away tough dirt and grime. Most important, the suds last! No more flat suds water before the job is done! Applied prior to waxing, Paintwork Cleansing Lotion will restore and preserve your car’s original beauty. It uses d-Limonene, a natural cleaner made from the rind of oranges, along with lemon oil, natural clays and sea kelp to polish without abrasives. Pinnacle Signature Series II produces clear, deep reflections on cleaned and polished paint. Natural carnauba wax gives Crystal Mist Carnauba Detail Spray its distinctive, wet-looking shine. Carnauba, combined with crystalline polymers, creates sharp reflections and silky paint. This state-of-the-art carnauba-polymer matrix also enables Crystal Mist to bond to the existing wax for an instant but long-lasting gloss. On top of Signature Series II Paste Wax, Crystal Mist reactivates the existing wax so you’re not just seeing a surface gloss – you’re seeing the depth and dimension of multiple layers of carnauba. The foam wax applicator can apply any wax evenly without creating any swirl marks. It’s absorbent in order to catch drips or runs, and it applies a perfect, even coat of paste waxes and polishes. A total retail value of $166.91. Save $46.92! for just $45.00! Save $5! 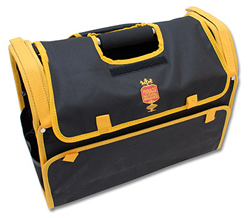 The Pinnacle Detailer’s Tool Bag is a storage bag and organizer for your detailing supplies, even your polisher! The bag is made of durable 600 denier nylon and measures 17 x 13 x 8 inches. Regular price is $49.99.